Are you a bit confused with all these expressions that are used when reading about grandfather clocks? Do you want help deciding on the right type of grandfather clock? The grandfather clock learning center wants to help you find an answer to you grandfather clock question. Should you not be able to find an answer to your question, please don't hesitate to contact me. I will get back to you with an answer. As with any piece of traditional furniture, traditionally styled grandfather clocks are classic, timeless pieces suitable for the elegant living area or hallway of your home. This style features solid wood cases in different shades with intricate carvings and metal detailing. These clocks are styled like those you would find in the finest antiques stores. Contemporary grandfather clocks are certainly not your grandfather's clocks. The traditional style does not fit in every home and it might be your taste. Clean lines, neutral elements and brushed metal finishes define these floor clocks. Contemporary pieces use elements of traditional style in less lavish and more understated ways. Contemporary grandfather clocks are great for the sleek, modern home. This clock style bridges the gap between traditional and contemporary by fusing elements of both styles into functional pieces for every home. Transitional grandfather clocks are streamlined and less ornate than traditional while not quite as bold and flashy as the contemporary style. – A split pediment is when the top of the clock is split, often with a finial (f.e bird) in the middle. The pediment can be curved ending in rossette or straight. An arched crown allows the face of the clock to be the primary focal point of the piece while still giving the clock an elegant, finished look. This type of hood has been used since the early 18th century. The flat top crown is often used in the transitional style grandfather clock because the flat top fits well in both contemporary and traditional décors. Grandfather clocks can have between 1 and 3 weights. One weight means this is a clock with just an hour strike. This is the case in the less expensive 30-hour clocks. Two weights indicate that this is an 8-day clock with a seperate weight for timekeeping and for the strike. 3 weights means that the clock has an additional 1/4-hour strike. These clocks appeared at the beginning of the 20th century. To help you find the right place for each weight, look at the bottom of the weights. In clocks produced in approx. the last 50 years, you will find a letter stamped. This is to help you with the position of the weight. If you find the letter "R" then this weight goes on the right. If you find the letter "C" then this weight goes in the center position. If you find the letter "L" then this weight is intended for the left position. Please be aware that when I talk about the right position, I mean your right when looking straight on at the clock. Now not every clock has these letter stamps on the weights. In case you have weights with no markings or ones with stickers or hand written instruction, you may be well advised to read on. Some clocks have wood stick pendulums. These require more weight. As the weight for the pendulum is on the right hand side then this is where the heaviest weight goes. As the other two weights are the same you place them on the other two trains, these are the time train in the center and the strike train on the left. Some grandfather clocks have what is called a lyre pendulum having a bob with a size of least 6.5 inches. In this case you will have 2 weights that are the same and a lighter weight. This lighter weight should go on the strike train in the most left position. And the other two will go on the other 2 positions in any order. This should solve most questions concerning the positioning of the weights. You can ask any questions on the forum which you find here. There are 3 types of clock movements. 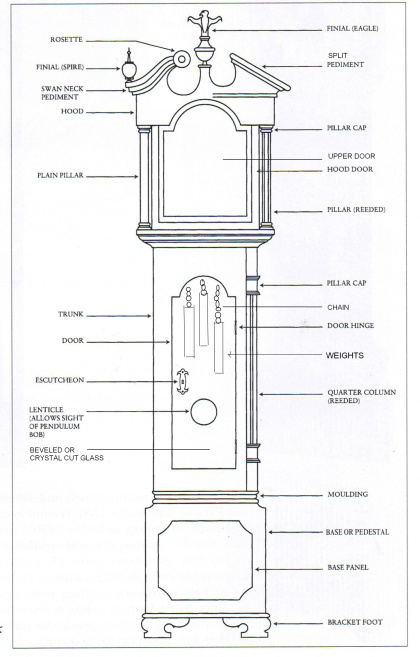 A grandfather clock with cable movement is one that is wound by using a crank or key to set move the weights up. The cable wraps around a pulley mounted to the top of each weight These clocks will have 1 to 3 key-holes in the clocks dial, one for each cable. This grandfather clock uses chains to wind the mechanism setting the weights in place. This will have to be done manually by lifting the end of chain with the weight and at the same time pulling the other end of that chain down. Quartz crystals are used in a number of our clocks, along with an electronic oscillator, to keep precise time. The first quartz clock was built in 1928 and was accurate within 1-2 thousandths of a second per day. This type of clock does not need a pendulum or weights to function.